There were five parades today on the 'Uptown parade route' but we hung around the house too long to catch them all. We walked into the middle of the Mid-City parade, with shiny floats built with colored aluminum foil. We wandered through the enormous block party that followed, dodging the running kids and the barrage of footballs thrown down the street. We found Rick and Judy and their family and squeezed our chairs in near theirs, across from St. Elizabeth's Asylum, just before the Thoth parade started. 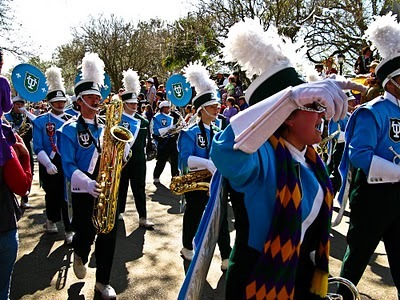 We're told that usually the crowd thins in the couple of hours between the day parades and the evening parade, and we hoped that we'd be able to spread out a bit and move closer to the street. 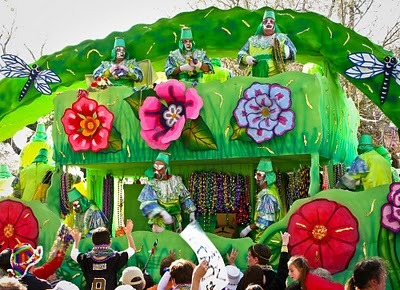 But Drew Brees, the Saints' QB, is this year's King of Bacchus. The whole city's turned out to catch a football or a string of beads from his nearly-anointed hands. 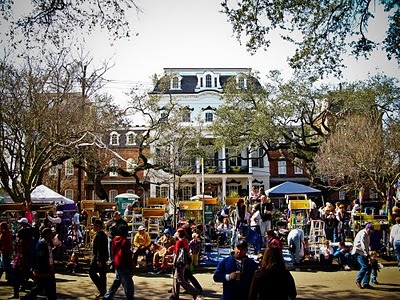 Even more people pressed themselves into the tiny gaps in the crowd, and the people next to us continued drinking and chain-smoking, and the street was full to bursting by the time the Bacchus parade started at 5:30. We're starting to get the hang of the way this is done. I took my turn holding an 80-pound kid on my shoulders to get her closer to the bead-throwers and passers-out-of-toy-spears, but Bryan was much better at it. We did in fact catch a whole bag of special beads and a stuffed animal from Breesus' float. 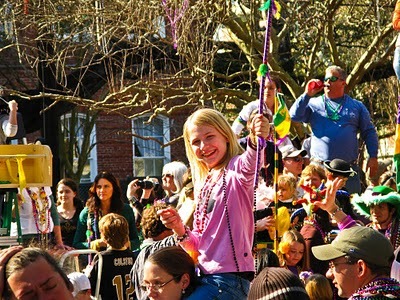 The parade went on and on, with beads and cups and stuffed things flying through the air, and people screaming. The local bands shoved us back against the curb. "GET IT BACK, PEOPLE! WATCH OUT FOR THE SWORDS!" I actually overheard one of the big, burly drum boys say very calmly, almost to himself, "I'd knock theah ahms off." Police are a constant presence at these parades; I don't know that there's been a time at any of them that I haven't been able to see a policeman. The crowds are loud and pushy but generally much friendlier and more polite than I'd expected. It wasn't at all unusual for people to catch something and then give it to a child nearby. At one point, two guys crossed the street in the middle of a marching band, and the nearby policeman shoved them hard, pushing them back across the street and into the crowd, delivering a terse lecture about manners. Then, just a few floats later, in a quiet moment, the same cop looked straight at me and said "Hewwo." I stared at him, completely baffled, and he added "My name is Elmah Fudd." It's a strange, strange place. Click to see the photo bigger.